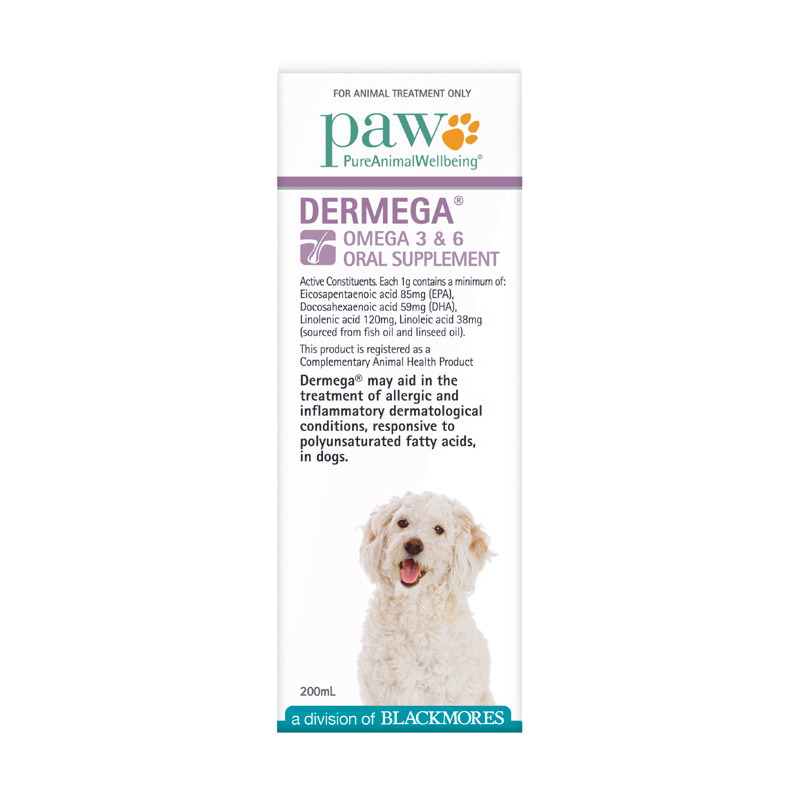 PAW Dermega® Omega 3 & 6 Oral Supplement is designed to improve your dog's skin health. Omega fatty acids within the formula help dogs who suffer from allergic and inflammatory skin problems. Or is your dog continually scratching? If the answer to any of the above is yes, your dog may benefit from omega 3 & 6 fatty acids to help alleviate these conditions. PAW Dermega contains omega 3 & 6 fatty acids including linolenic acid, EPA & DHA that may aid in treatment of skin conditions responsive to polyunsaturated fatty acids. Paw Dermega is easy to administer and comes with an innovative non drip, measured dose pump so it can be added to food easily with no mess. PAW Dermega comes in a 200ml bottle, with an non drip, no mess pump. Each pump provides a measured 0.5ml dose. Dose = 1ml (2 pumps) per 7kg. Ingredients: Contains pure & fresh fish oil and linseed (flaxseed) oil - stabilised using vitamin E.
Safety Directions: For Animal Treatment Only. Avoid contact with eyes.